Food shortages and exploding food prices, after bankrupting entire nations, are some of the next steps on the elite agenda. We could easily green the entire Sahara desert in only a few years. We have the technology to do this and it would be unbelievable cheap, but the elite agenda is different. If we allow them to get away with all their crimes, then we are really in more trouble then we can imagine in our worst nightmares. Start to grow your own organic garden this year and prepare yourself. By changing our reality we influence the world. The elitists want to push GMOs as a solution to the coming world hunger crisis, that they themselves have created in the first place. Dr Henry Kissinger, at the height of his powers as US Secretary of State, was speaking to the landmark 1974 World Food Conference. Since then, the number of hungry people worldwide has almost exactly doubled: from 460 million to 925 million. And this week the airwaves have been full of warnings that the formidable figure could be about to increase further, as a new food crisis takes hold. Some experts warned that the world could be on the verge of a “nightmare scenario” of cut‑throat competition for the control of shrinking supplies. The cause of such alarm? 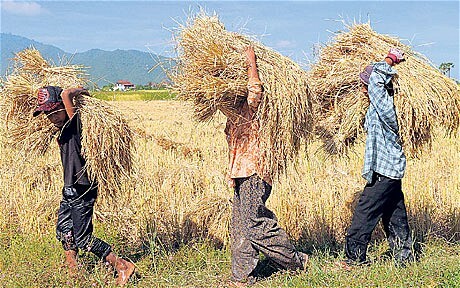 On Wednesday, the Food and Agriculture Organisation (FAO) reported that global food prices had hit a record high and were likely to go on rising, entering what Abdolreza Abbassian, its senior grains economist, called “danger territory”. That is bad enough for Britain, adding to the inflationary pressures from the soaring cost of oil and other commodities, not to mention the VAT increase. But for the world’s poor, who have to spend 80 per cent of their income on food, it could be catastrophic. Robert Zoellick, president of the World Bank, warns that the rising prices are “a threat to global growth and social stability”, and Nicolas Sarkozy has identified them as a priority for the G20, which he chairs this year. Already they are higher than in 2008, when they drove the tally of the malnourished briefly above a billion for the first time in history, and caused riots in countries as far apart as Indonesia, Cameroon and Mexico. That ended nearly two decades during which the number of hungry people had stayed the same, while the world population grew by 1.2 billion, so that the proportion of an increasing humanity without enough to eat steadily fell. But the crisis of two years ago, and the one that may be unfolding now, are polar opposites of the one behind the World Food Conference. Then, bad harvests had produced a real shortage. Now, we have bumper crops: the past three years have produced the biggest harvests ever. The issue is not one of supply, but of demand. The mushrooming middle classes of India and China helped cause the 2008 price hike by eating more meat, which, in turn, mops up grain: it can take, for example, 8lb of cereals to produce one of beef. And cars contributed as well as cows. Biofuels (another project on the elite agenda) transferred over 100 million tons of cereals from plates to petrol tanks: to fill a 4 x 4 tank requires enough grain to feed a poor person for a year. Speculation, too, helped drive prices up. The same factors are at work again, though fortunately the hungry are not yet as badly hit. This is partly because the price of rice, which feeds almost half of humanity, has remained relatively stable; and partly because it is mainly the higher-quality wheat and maize – eaten by the better off – that has got much more expensive. But things remain volatile, since the world has heavily run down its grain stocks over the past decade, and much of what remains is in China, which does not readily release them even when prices are high. So the present abrupt rises have been brought about by a harvest that is only 1.4 per cent down on last year, and prices remain unusually hostage to the weather. So if it is all so precarious at times of bumper harvests, what will happen if – or rather, when – we get a really bad one? That is what is worrying Lester Brown, president of the Washingtion-based Earth Policy Institute, whom I first met at the 1974 conference. A former champion tomato-grower – then an enthusiast for the Green Revolution, now a leading prophet of danger and one of the first to forecast the present situation – he is publishing a book on the issue on Wednesday. Imagine, he says, if last year’s Moscow heatwave – which sent average temperatures 14F above normal, and contributed to this year’s smaller harvest – next hit Chicago and the Midwestern bread basket. The US harvest could slump by 40 per cent, sending prices “off the chart” and cause “the global economy to start to unravel”. As the climate changes, such extremes are likely to be more common. Back in 1974, Kissinger spoke of the “thin edge between hope and hunger”. A generation on, it is time to take it seriously. Worried? It could be worse. In India, the role of Britain’s streetfighter foxes is increasingly being filled by, well, leopards. Driven from their natural habitat by its destruction, drawn by the easy pickings of urban life, the big cats are now constantly spotted in the subcontinent’s towns and cities. Stray dogs are a staple diet, but the leopards also regularly kill people. Indeed, in June one even took on the Indian Army itself, injuring 12 adults and children near the gate of the military academy at Dehra Dun. Both foxes and leopards are aggressive, adaptable animals, and both are thriving. There are now thought to be 34,000 urban foxes in Britain, visiting more than a third of the country’s urban gardens at least once a month. And the leopard – which is also increasingly invading South African cities – has avoided the fate of, say, the endangered tiger: by one estimate more than half a million of them are at large. Could their motto be: “If you can’t beat them, eat them”?